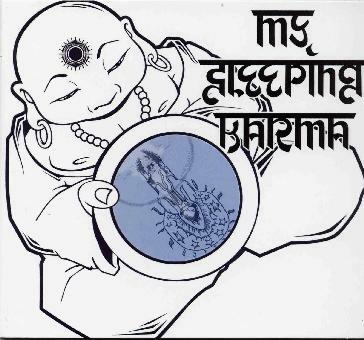 My Sleeping Karma - "III"
The band that grew out of the remains of The Great Escape is back with their third instrumental record. While from the biography that came with the CD you would think that they had reinvented themselves and you would hear something completely new but not really. The opening track, Brahama, starts like many of their other tracks and they reuse that same guitar line that was borrowed from Monkey 3 to begin with and use it over and over in repetition. But they do have some good dynamics with coming up and down in pace and intensity but it is nothing really new or different, yet. Parvati is a short 2 minute piece, very melodic and pretty, and interlude that heads into Tamas. This track has some very nice delay guitars on it and is a bit more post rock dream territory but the same build up in dynamics and repeated guitar riffs over and over and never any solos. He does kick in a few guitar pedals though so the tone is changing some even if the riff is more or less the same over and over and over. Sattva is a short 3 minute track where the band experiments with a bit of different kind of soundscape of delay guitars, simple drums and spacey sounds and a female voice. Shiva starts with a drum beat and a more uptempo guitar and a light organ sound at the bottom. It is pretty damn groovy this one and reminds me a bit of Brank Bjork at first. Sadly they bury the organ, which would have really given the CD a song with a more unique sound and not sound so much the same. I like the more spacey aspect of this track and it is less repetitive. Vishnu is another short bridging track and quite like the last one but guitar sounds like a keyboard or maybe it is both and again the ethereal voice can be heard. Takshmi is a more uptempo track. After another short piece called Rajas, the CD ends with Sarasvati, one of the more intense tracks. If you like their other albums and don't tire of this type of melodic repetitive riff rock, you will dig this for sure.